Finding businesses that have organic baby items made right here in the USA is something more and more parents are looking into. 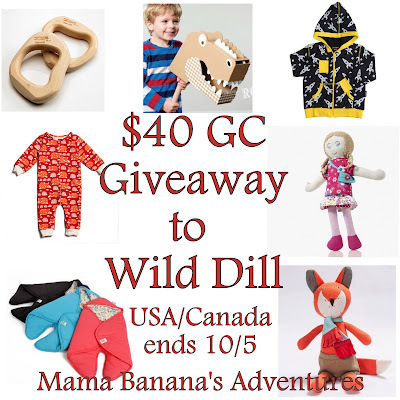 Wild Dill is an online shop dedicated to natural, organic and responsibly sourced baby and children's items. This Mom run and owned company offers many unique and attractive items for little ones. Read Mama Banana's Adventures Organic Bunting Bag Review and learn more about the company. Here's your chance to win a $40 GIFT CERTIFICATE to Wild Dill! Open to USA and Canada, ends October 5th, 2015.